Turnaround Houston! is an initiative launched by Mayor Sylvester Turner in efforts to address the barriers to employment that many Houstonians face. 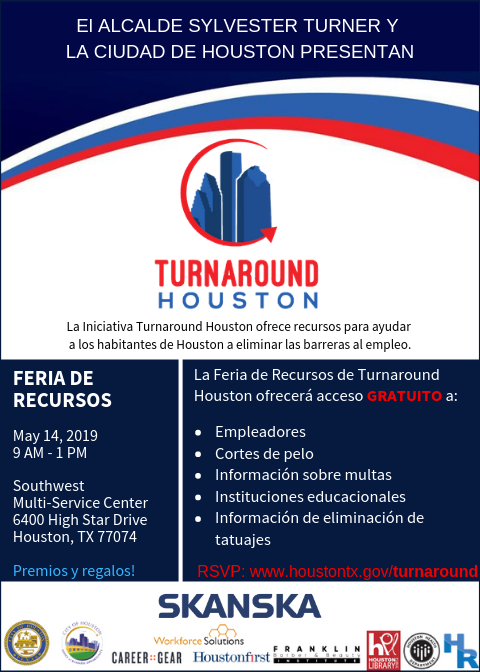 Turnaround Houston will offer access to job training, resume writing, tattoo removal, social service agencies, educational institutions, counseling and intervention to help hard to employ Houstonians turn their lives around. 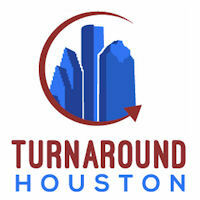 The inaugural Turnaround Houston took place Saturday, March 26, at the Sunnyside Multi-Service Center. Partner organizations and company employers wishing to have an exhibit table at the event can also contact Norma Meadows at Norma.Meadows@houstontx.gov or via phone at 832.393.0615. Please check back frequently as we will be updating this page with other participating organizations. Turnaround Houston and H-GAC’s Gulf Coast Workforce Board - Workforce Solutions, have partnered to implement the National Disaster Workforce Recovery Program which provides temporary jobs to support the City of Houston’s post-Harvey efforts for the extensive cleanup and repairs of various City facilities and public spaces, as well as respond to the increased demands of City services, and provide humanitarian assistance to Houstonians devastated by Harvey. Is currently receiving unemployment insurance. Persons interested in these positions can visit any Workforce Solutions Career Center http://www.wrksolutions.com/find-a-location for eligibility determinations. 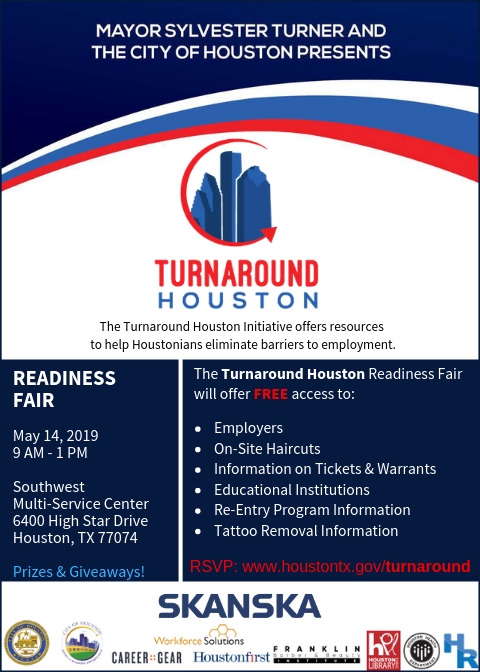 We are pleased to announce the next Turnaround Houston Readiness Fair! 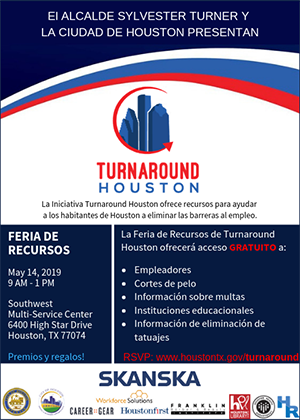 The fair will be held on Tuesday, May 14, 2019 from 9 a.m. to 1 p.m. at the Southwest Multi-Service Center, 6400 High Star, Houston, TX 77074.